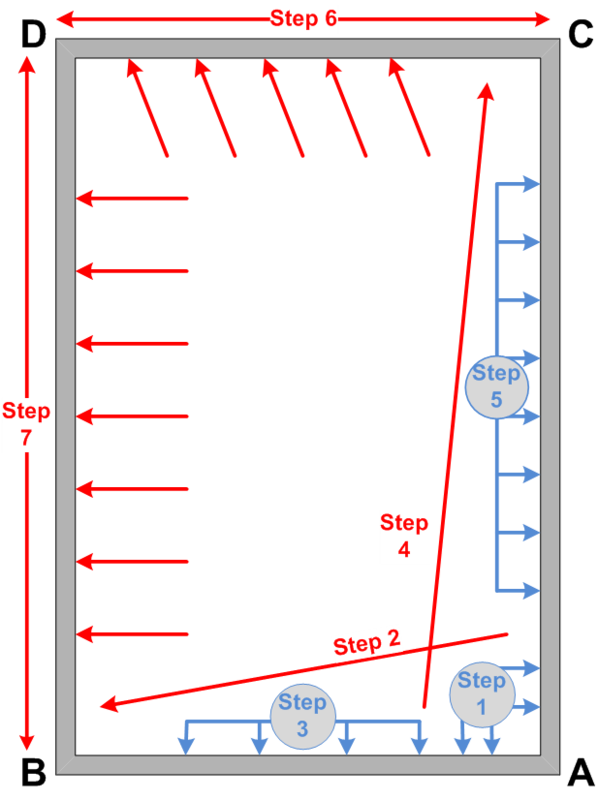 Power-stretch carpet following the 7 step procedure described in Figure 3. In the absence of carpet manufacturer stretch recommendations, use this diagram. For Woven Carpets, contact manufacturer for stretch-in requirements. NOTE: Size and shape of the room will determine corner designation. Red arrows denote use of a power stretcher and blue arrows denote use of a knee kicker. Step 1: Hook onto tack strip approx. 3 ft. in both directions along corner A. Step 2: Power stretch at approx. 15° angle from wall AC and hook onto tack strips at corner B. Step 3: Hook & secure onto tack strip with knee kicker along wall from A to B. Step 4: Power stretch at approx. 15° angle from wall AB and hook onto tack strip at corner C.
Step 5: Hook & secure onto tack strip with knee kicker along wall from A to C.
Step 6: Power stretch at approx. 15° angle from wall AB and hook along wall from C to D.
Step 7: Power stretch from wall AC and hook along wall from B to D.
The use of a Power Stretcher is MANDATORY. Devices used as a substitute for, or an attachment to such devices that penetrate through the carpet backing may cause injury, damage carpet or substrates, or result in inadequate stretch. Such devices are not acceptable. •Ability to lock the stretch in place. •Adjustable metal tubes ending in a padded tail block/plate.